What constitutes a great goal? 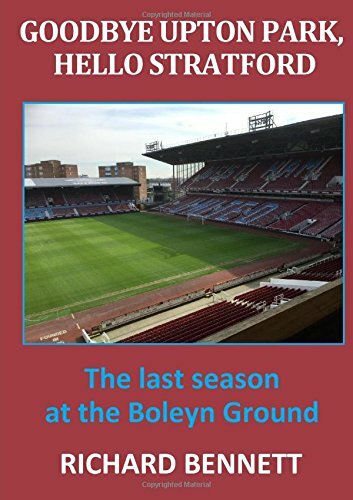 When I wrote my book, Goodbye Upton Park, Hello Stratford, I posed this very question in Chapter 23, where I wrote about my 60 favourite West Ham goals. Goals can be scored in a variety of ways. A spectacular volley, a long range screamer, a team goal scored as a culmination of a number of passes, a deflection, an element of luck, a tap in, a goal which requires superb technique. These are just some of the ways that a goal can be scored. A goal can seem greater, and hence remembered more, if it is a critical goal in a close match, as opposed to say, one of the goals scored in a one-sided game. But however it is scored doesn’t really matter because in the final analysis, every one counts as a goal; you don’t get anything extra based on the degree of difficulty. I think that my colleague, and co-weblogger, Geoff, is particularly fond of team goals, and I like those too, although my absolute favourites tend to be those that require great technique. My favourite goal of all time was scored by Martin Peters against Leicester in November 1968. This was a team move that went from one end of the pitch to the other, culminating in Peters’ superb technique in hitting a volley from a ball that came over his shoulder, and his thunderous shot that almost decapitated Shilton in the opposition goal as it sped into the roof of the North Bank net. My second favourite (in 2001) came from a corner taken by Schemmel, who played the ball in the air to Joe Cole who was standing near the corner of the penalty area. With a couple of touches and masterful ball control, without the ball touching the ground, Joe volleyed the ball to the opposite side, where Trevor Sinclair took off, and with an acrobatic scissor kick blasted the ball into the corner of the Derby net. Number 3 was a volley scored by Harry Redknapp of all people, the winning goal in a 4-3 victory over QPR. Once again this was a great team move ending in a stunning volley from Harry. This goal had almost everything, a superb build up, pin-point cross, brilliant finish, and winning goal, all in one. On Saturday we were treated to another goal that will live long in the memory from Andy Carroll. A good move was ended when Antonio’s cross, perhaps a couple of yards behind where he was aiming, was met by a stunning overhead scissor kick, with great technique, and unstoppable power. The goal put us two ahead, which was an important time in the match. It reminded me, for both technique and power, of a stunning goal scored by Trevor Sinclair before he joined us, for QPR against Barnsley which was goal of the season in 1997, although I only saw it on TV. Our first goal wasn’t bad either. Antonio, when put through rounded the keeper, who did a good impression of Adrian (or David James, perhaps) in coming out for a ball when he shouldn’t have, and his ball across the goal (probably an attempt to score) was finished off by Feghouli. The first goal in a game is always important, and this came at a time when our improved second half performance needed a goal. And our third goal which finally sealed the victory was another counter attack, a length of the pitch move, with a perfectly released ball from Antonio that still left Lanzini which half of the pitch to cover, before once again, excellent technique in dinking the ball over the keeper who left his goal to narrow the angle. All in all, a very satisfying victory over our old manager who, incredibly seemed to suggest that his team were better than us. After the week of being in the news, thanks to a Frenchman (who has scored some excellent goals himself for us in the past year) who apparently doesn’t want to play for us any more, it was an excellent second half performance (the first half was certainly forgettable). Andy Carroll summed it up nicely when he declared in his post-match interview that no individual is more important than the club, and the support from the stands for the manager was noisy and emotional. The win took us up to twelfth in the table, nine points clear of the relegation zone, and just one win away from the top half of the table. In my pre-match preview I expressed the hope that the events of the past week would have a galvanising effect on the team, and that was most certainly the case. Some excellent individual performances from Byram, on as a second half substitute, Reid, Obiang (as always), Antonio, and Carroll were important, but the spirit of the team as a whole shone through, even though some of our players have not been at their best this season. I’m not sure when “assists” started to be recorded, but I wonder when was the last time one of our players contributed with three assists in a game? Great credit to Antonio, who apparently spent all day Friday in bed with the flu, but still insisted that he was fit enough to play the next day. His attitude and commitment put a certain French footballer to shame.